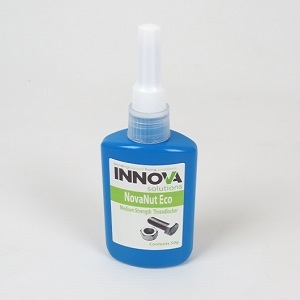 NovaNut Eco – Medium Strength Threadlocker is produced from our latest non-hazardous technology incorporating a bespoke group of high purity raw materials. This unique future-proof technology ensures that the product label requires no hazard symbols or risk and safety phrases, and enables the product to comply with even the most stringent health and safety requirements. It is an oil tolerant medium strength threadlocker, that cures anaerobically to lock all types of metal threaded fasteners. It is designed for applications that require future disassembly with standard hand tools, and offers excellent temperature and solvent resistance once cured. The product is also thixotropic, which aids assembly by reducing the migration of the liquid adhesive following application. This grade can even cure rapidly on plated, oily metal, or inactive surfaces. Replacing lock washers and plastic inserts. Locking machine tool access bolts. Locking and sealing gear box and drive shaft bolts. For best results clean all surfaces with a cleaning solvent and allow to dry. Shake the product thoroughly before application. Apply the adhesive to the fixing position of the fastener or onto the internal threads of a blind hole. Use suitable methods to assemble components, and tighten to required torque level. Allow to cure fully before applying load. Should be stored in a cool dry area, out of direct sunlight. Stored correctly , this grade can offer a 12 month shelf life from manufacture. Please consult the MSDS, which contains full information regarding the use of this product, including Transport, Disposal, Toxicological, Exposure Controls, Accidental Release and First Aid measures essential to the safe use of this product.